After considerable consumer backlash it appears the big banks, such as Bank of America and Regions Financial Corporation, have decided to drop their controversial debit card fees. Bank of America is dropping its controversial debit card fee, the Wall Street Journal reports. Consumers slammed the bank after it announced in September that it would charge customers $5 per month to use their debit cards for purchases starting in 2012. 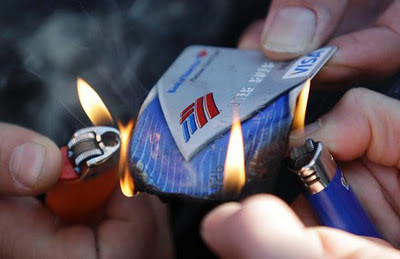 Bank of America is the latest to back away from charging a debit card fee; the bank's decision comes just hours after SunTrust Banks and Regions Financial Corporation, two of the country's largest banks, announced that they would be dropping their fees for debit-card purchases. Previously, SunTrust had charged some of its customers $5 a month for debit card purchases, and Regions had been charging some customers $4. Neither bank will impose those fees going forward, and customers of both banks will have their fees refunded, according to the WSJ. Officials at both SunTrust and Regions acknowledged that consumer backlash played a role in the decision to abandon the debit fees. Bank of America, SunTrust and Regions are only the latest major banks to back off from debit card fees, which have proved wildly unpopular among customers. JPMorgan Chase said last week that it's not going to charge a fee for debit card use after testing the program for eight months. Wells Fargo also said last week that it would drop its $3 debit card fee, according to the WSJ. I find this reversal interesting because these banks decided to introduce their fees at the same time and within hours these banks decided to drop such fees. Seems suspect if you ask me. Not every bank decided to gauge their customers. Some saw the fees as an opportunity to steal disgruntled customers away by pledging not to introduce such ridiculous use charges. It is also questionable as to whether or not the introduced fees would have violated law. While federal law caps per charge fees a bank may charge, the one time fees now dropped would have topped those caps for consumers who rarely use their cards. Regardless, these banks' reputations have suffered even more so because of this ordeal, not like they care.